Chicago Blackhawks Take Home 3rd Stanley Cup In 6 Years With 2-0 Win : The Two-Way The Lightning offense struggled, getting just 24 shots on goal. Tampa Bay also won half as many faceoffs as Chicago and had six penalty minutes to the Blackhawks' two. 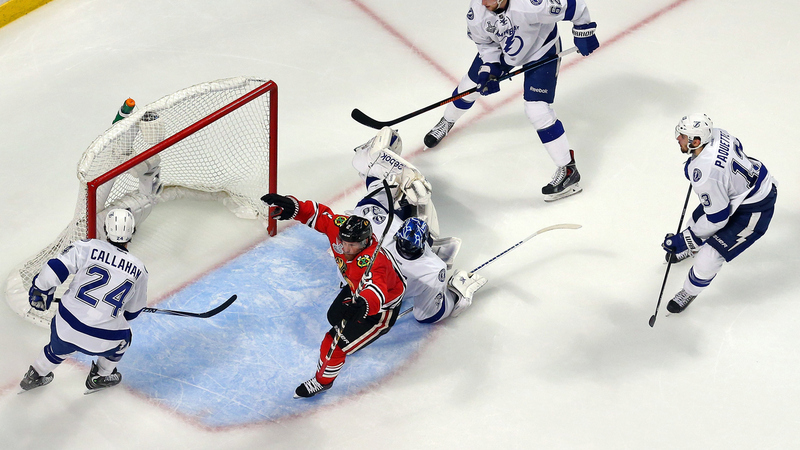 Duncan Keith of the Chicago Blackhawks scores a goal Monday in the second period against goalie Ben Bishop of the Tampa Bay Lightning during Game 6 of the 2015 NHL Stanley Cup Final in Chicago. For the third time in six years, the Chicago Blackhawks have won the Stanley Cup. Their 2-0 victory Monday night over the Tampa Bay Lightning even offered an opportunity the team didn't have the two previous times — the chance to celebrate the title on its home ice. It's Chicago's sixth Stanley Cup overall, having previously also won in 1934, 1938 and 1961, as well as the two recent titles in 2010 and 2013. Defender Duncan Keith scored the first goal, putting in his own rebound in the second period. It was only his third goal of the playoffs and his 13th of the season. After the game, he was named the most valuable player of the Stanley Cup playoffs, the first defender given the honor since the Anaheim Ducks' Scott Niedermayer in 2007. Star winger Patrick Kane added a wide-open insurance goal late in the third period off a Brad Richards pass. Center Jonathan Toews, who captained all three of the Blackhawks' recent title winners and who was named most valuable player of the 2010 playoffs, was the first to hoist the cup. The Lightning offense struggled in the game, getting off just 24 shots on goal against Corey Crawford, the fewest the Blackhawks goalie had faced in a game since first-round games against the Nashville Predators. Even playing six-on-four for a minute as the game wound down, Tampa Bay got few good opportunities. The Blackhawks won more than twice as many faceoffs as the Lightning, and had two penalty minutes to Tampa Bay's six. 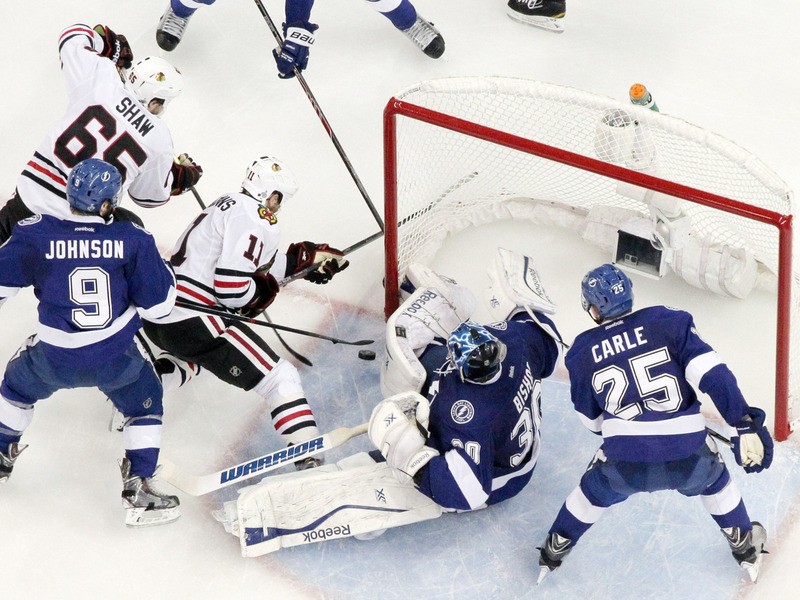 The Lightning and Blackhawks battle in the Tampa Bay crease during Game 5 on Saturday, with Chicago eventually winning and taking a three games to two lead in the Stanley Cup Final. Game 6 is Monday night in Chicago. Despite allowing the goals, Tampa Bay goalie Ben Bishop had a good game, with 30 saves on 32 shots. Chicago has a lot to play for in Game 6 of the Stanley Cup Final Monday night. A victory will not only clinch the team's third championship in the past six years; more important, it would be the Hawks' first Cup win on home ice since 1938. "Obviously there's a lot of buzz, a lot of excitement," said Chicago captain Jonathan Toews. As of late Monday afternoon, the cheapest ticket available for the game on StubHub was listed at just over $1,000, and that was standing room. If you wanted to sit and watch the game, that was over $1,600. For the Lightning, who played hard but suffered their second straight 2-1 loss to Chicago on Saturday, the challenge in trying to force a Game 7 looks huge. Chicago's United Center is already, arguably, the loudest arena in professional hockey. It will be decibels louder than ever tonight. And there is no question that this veteran Chicago team, which looks to be broken up this summer over salary cap issues, will want to win this one at home. "It's tough to put your mind off that and think about other things that don't include the end result of winning here tonight. It's going to be in your mind no matter what," Chicago veteran forward Patrick Kane told reporters Monday. But Tampa Bay captain Steve Stamkos says they're ready to be spoilers. "We'll find a way," he said, "There's really no choice that we have." I guess you can call that cornered-animal optimism. And Stamkos is more cornered than most on his team. A power forward who is regularly among the league's scoring leaders, Stamkos has scored exactly zero goals in this Final. "Has Stamkos been good enough in this series? And the answer is absolutely not. ... This is the game Stamkos has to show up." But there are signs of hope for the Lightning. The team's second leading scorer, Nikita Kucherov, looks likely to play Monday night. Part of the high-scoring "Triplets" line, Kucherov left Saturday's game after colliding first with Chicago goalie Corey Crawford and then with the goalpost. "You can't keep Kuch out for long," says line mate and the playoffs' leading scorer, Tyler Johnson, who appears to be nursing injuries of his own. And Lightning goalie Ben Bishop, who missed Game 4 with an undisclosed injury, also says that whatever it is ailing him is "getting better every day." Also consider the fact that this is the first Stanely Cup Final ever to be decided by one goal in the first five games. Neither team has had a two-goal lead. With games this close, missed chances and lucky bounces can make the difference. It could easily go either way. Game 6 is at 8 p.m. ET.